You check on Michelle; it looks like she's about done shopping, and is about to head back to the bunker. You cuddle the rat, you feed it snacks, and you give it back to Dr. Finch. You also ask the group about where to put the baby red. "I dunno," Caius says. "How big's it gonna get...?" "If it's like the one in Blondie's basement," Fuse says, "it'll mostly be like... a huge mouth on the wall. I think." "We ain't got a lot of bare walls," Caius ponders aloud. "We got... well, I guess this blank wall here in the lab. Dunno if havin' that loom over Dr. Finch's shoulder'd be a problem or not." Dr. Finch considers it for a second. "On the one hand, it would take... a little adjusting on my part, to be sure. But... but but but, having an extraterrestrial entity with that amount of knowledge nearby could have its advantages. I've no issues with letting it take root in here." "An' I only bother comin' in here when somethin' crazy's goin' on, so it don't matter to me," Caius adds. Fuse shrugs. "By now that giant mouth is only like... the fifth or sixth weirdest thing I've experienced. So, whatever--it's your call." Not too much time later, Michelle returns. "Alright, we got clothes now," she says. "I'm gonna take a shower... we been on the run so long, I almost forgot they exist." To kind of re-focus on plot relevance, I agree with Steve - check on other bunkers if possible until tomorrow comic-time before settling on planting baby Red. The other option is to perhaps try catching up with Grizwald if possible. He'd have overheard that conversation between Knox, Shirai and Thale's secretary, PLUS he got that reporter out. There's probably a lot going on there we could perhaps benefit from being privy to. Speaking of, we never did tell the others that Grizwald rescued the reporter, did we? Prolly should do that. Besides, now he's probably looking for us too, what else is he going to do with a reporter who isn't safe in public? I definitely feel we'd need a better room for deploying Lil Red. This looks a bit cramped, and mayhaps another room could be found...? I mean, unless people are suddenly stuck on this room. Wait, Lil Red should know how much space would be needed, cause that's what he was made for. I don't think we actually want to plant Red in the current room, it's just that we don't have too many options right now. This bunker has 3 rooms and the entry hallway, and considering 2 of those rooms are the sleeping quarters and the bathroom, it's either this or the entrance, and the entrance hall is even more cramped. I agree with you and Steve, let's not be too hasty, and let's ask Baby Red how big it will become, and also, how long time will it take? Will the connection to Mom's Red be made in hours, Days or Weeks? And will it be possible to move Baby Red after the planting has started? When is it time to think about organizing some treatments for poor Fuse? It's been, what, a few days since he was severely burned? We've got one or two time critical things - Grizwald and Howler's, but for once we've got some breathing room. Even if a full treatment is out of the question right now, could Dr. Finch rustle up some possible colleagues who'd help at some stage with supplies or an operation? It's worth asking Dr. Finch however, it can't hurt to ask, right? On that note, you know what would be really cool to find in one of the secret bunkers here? An old-school bio-printer from yesteryear. Like, one that would still work well enough to use, but be like super old and run on MS DOS or something. Hehehe. At some point in the future, we should see about tinkering with our powers some more. Knowing how to simulate chatter should be useful for interrogation, and some practice with regeneration in a controlled environment should cut down on extraneous teeth/hearing organs. If regeneration practice is a bit much, then some anatomy study is advisable. We're supposed to be the good guys, Chatter is of limited use for us. We get our information by sneaking and smarting. Or rather, chatter via blood is of limited use, and we've never experienced it, and I don't know if we know how it works, so we might not be able to replicate it. which I see as no big loss. Technically Chatter is a bit moot to mimic - once Jane reds up someone she could force them to answer her questions. A bit on the dark side, although we already extracted several of Macland's secrets... at a cost. 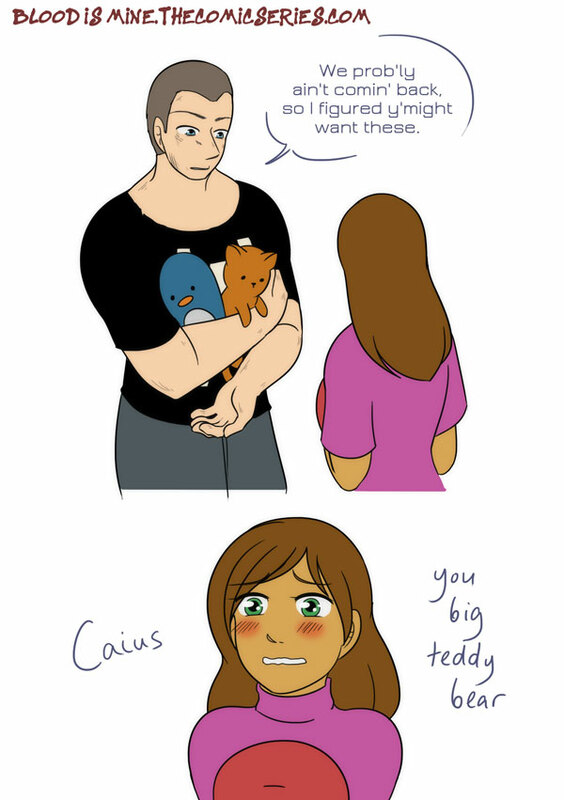 Fanart of the scene from this page, when Caius comes with an armful of Jane's stuffed dolls. This all honestly makes me feel like this group is just a big ol' family in one way or another. It must have royally sucked when she lost her parents as she did. She and/or Red might be affecting them unconsciously to heal her wounds... but that's not too bad in my book.